I have been trying to wake up early. When we first got our cows Dave had to be up at 5am to bottle feed them, and so we made a habit of being up early. But once they were old enough to stop being bottle fed 5am very quickly turned into 8am. And then I worked very hard to get up earlier….to no avail. I have been getting over a lung infection that has lasted almost a month and that meant waking up at…*eek*….9am. But! This week I’ve been up at 7 almost every morning! Glorious! 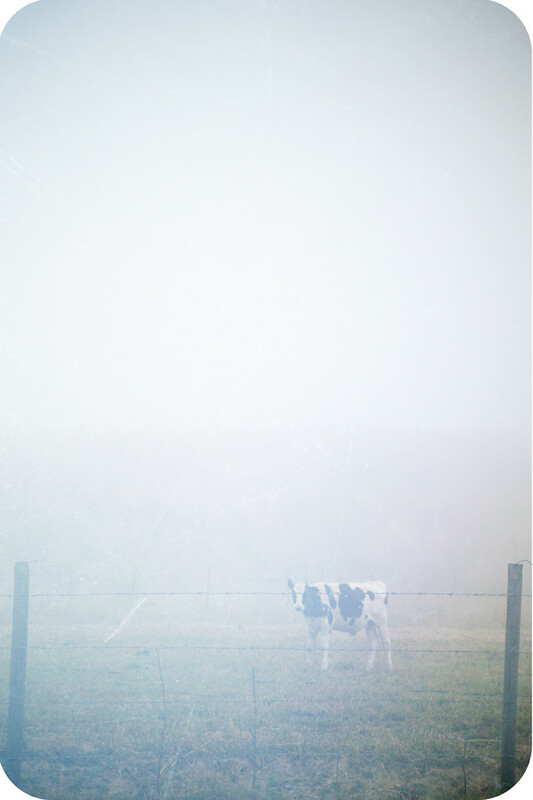 On account of me being up so early, I went out and snapped some pictures of the cows mooing their hearts out in the thick fog. A foggy morning was a little unexpected. The last month has been so dry. We have ne’er had a rain cloud since some time in June. I do like the warm weather. But a foggy morning like this makes me soooo antsy for Autumn. It is my absolute most favourite time of year. I’m sure this fog will be gone by 10am. But I’m still enjoying it. This entry was posted on Thursday, July 29th, 2010 at 7:45 amand is filed under 365, fall, weather. You can follow any responses to this entry through the RSS 2.0 feed. You can leave a response, or trackback from your own site. I couldn't believe the fog yesterday! It was indeed a little unexpected. I like your cow picture. Your fruit salad from today's post looks delightful, as well.